One doesn’t do two tours of Germany as a military household without developing a taste for weiner schnitzel. However, my family will substitute pork or use chicken in place of the veal. Typically, we go for boneless chicken thighs as the dark meat imparts a good flavor but there was a pre-holiday sale on chicken breasts, so we went all out. We’ve found that seasoning the flour adds a really nice flavor to the finished product without making it too hot or seasoned. Combining breadcrumbs and cracker meal adds a lovely crunch to the coating and it helps make sure that reheating them doesn’t make them soggy (these make great sandwiches). We did close to 10 lbs of chicken, as Dad is about to head off to hunting camp and I can always use some quick meals from the freezer. Pound the chicken to uniform thickness of at least 1/4 inch and as thin as 1/8 of an inch. Place flour in a pie plate and season with 1 teaspoon each cayenne, salt and pepper. Place eggs in a shallow dish and scramble with about a tablespoon of olive oil. Place bread crumbs and cracker meal in another shallow pan and mix well. 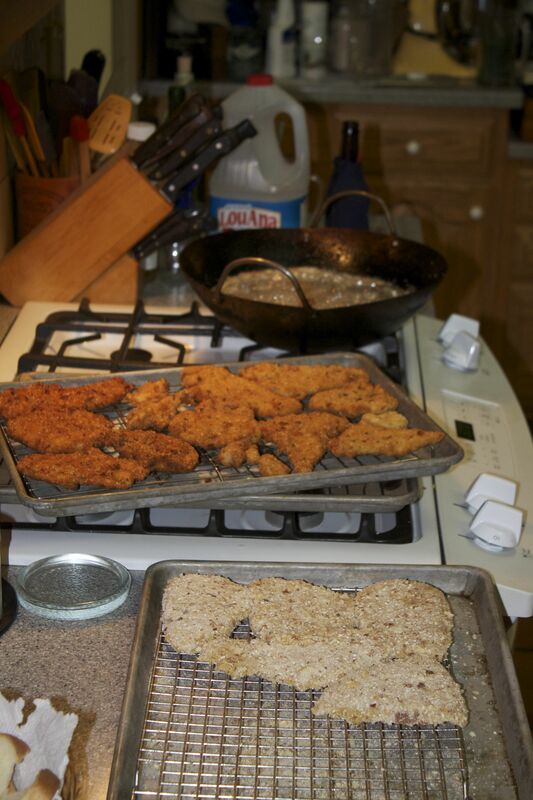 Dredge the chicken in the flour, coat with the egg mixture and then pat on the breadcrumb mixture. Let the chicken sit in the refrigerator for at least an hour and as long as 8 hours. Bring the peanut oil to 350 degrees F and fry a few pieces at a time for about 5 minutes, turning once to ensure that both sides are golden brown. If your cutlets are 1/8 inch, you’ll only need to cook them for about 3 minutes total. Drain on wire racks over a paper bag to catch the oil. Serve with lemon quarters for squeezing over and pommes fritten (French fries). 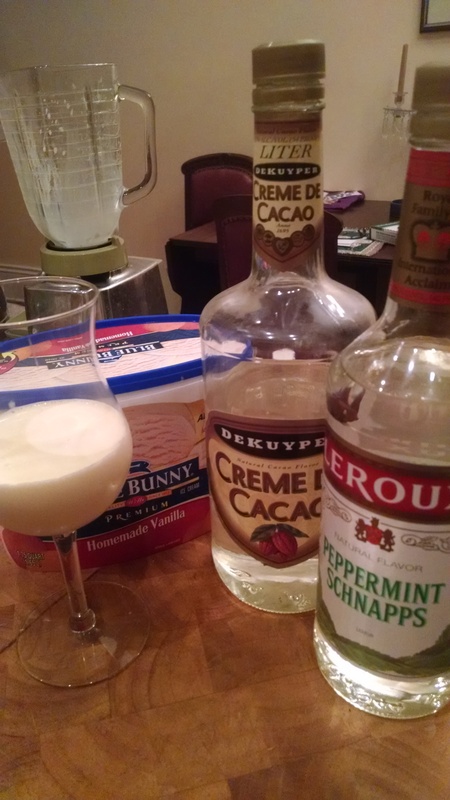 I’m still on a Peppermint Schnapps kick and I decided it was ice cream time. Lucky me also had a bag of Andes Creme de Menthe baking chips, so I went for mint chip ice cream. This calls for a cooked ice cream base (because of the egg yolks), so figure in time for the custard to cool into your planning. Place milk and cream into a heavy saucepan over medium low heat. Bring to a simmer, stirring regularly. Stir in vanilla extract. In a mixing bowl, whisk together the sugar and egg yolks until the mixture is smooth and pale yellow. Add the drop of red food coloring to make the mixture a light pink. 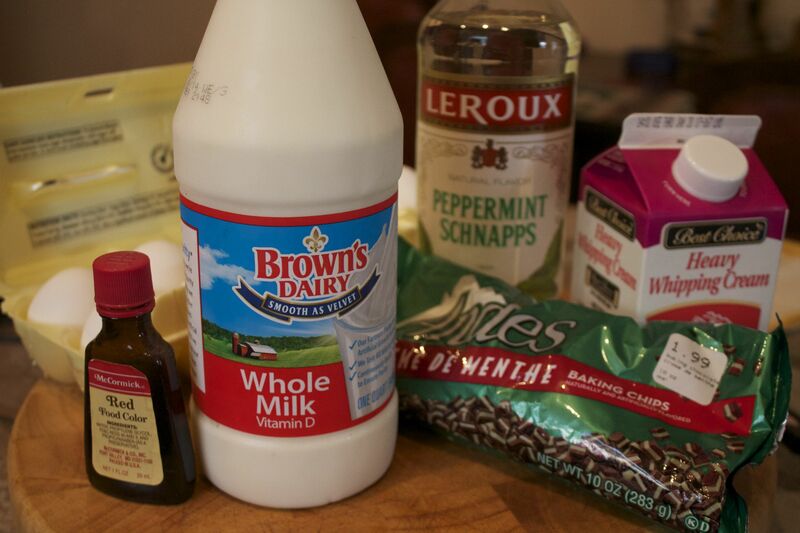 Add some of the simmered milk mixture to the the sugar mixture and whisk together. Once tempered, add the sugar and egg yolk mixture to the milk and cream. Stirring constantly, cook the mixture until it thickens, about 15 minutes. Pour the custard into a bowl and allow to cool slightly before putting it in the refrigerator for at least 4 hours and as long as overnight. 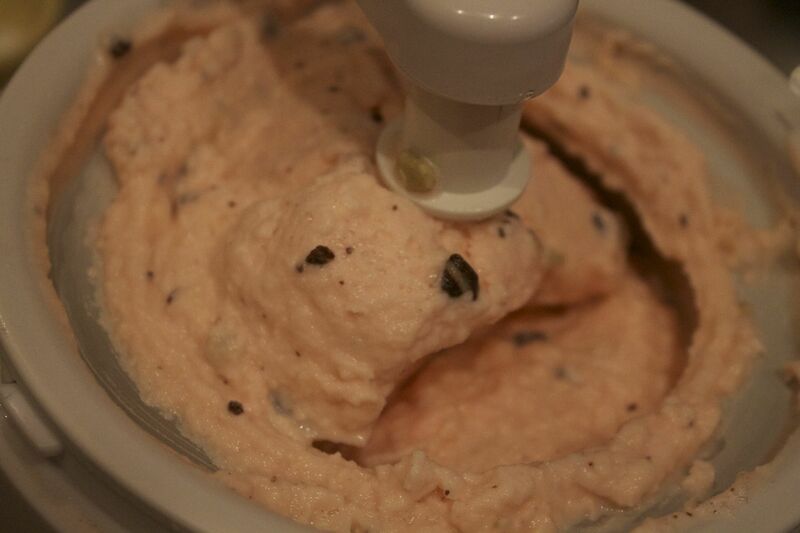 When ready to process in your ice cream maker, whisk in the peppermint schnapps and baking chips. Process the ice cream for 20 minutes or so, according to your ice cream makers directions. It will be at the soft serve stage. 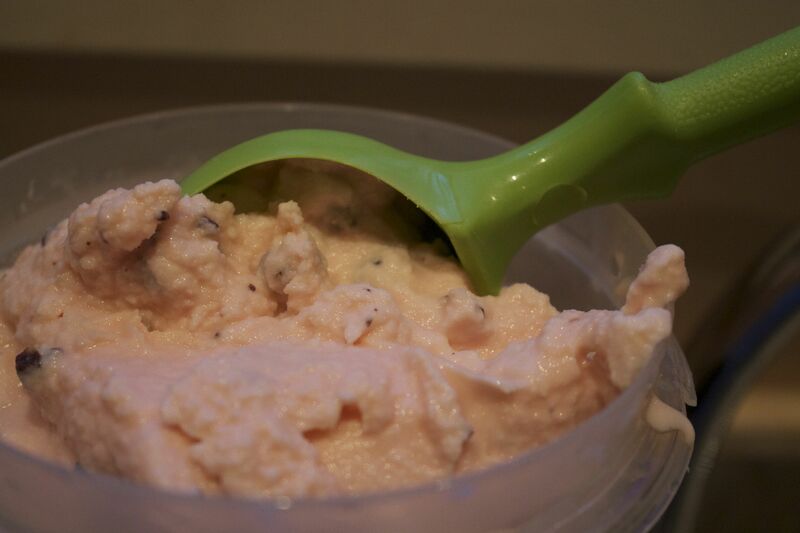 Place in a container in the freezer until ready to serve. Ah, December! The time of the year when I can pull out that bottle of Peppermint Schnapps that has been gathering dust and put it to use. I could fall back on the classics like the Stinger (1 part Peppermint Schnapps to 2 parts Brandy and pour over ice) or the Girl Scout Cookie (1/2 oz each Bailey’s Irish Cream, Kahula and Peppermint Schnapps shaken over ice and strained into a glass). 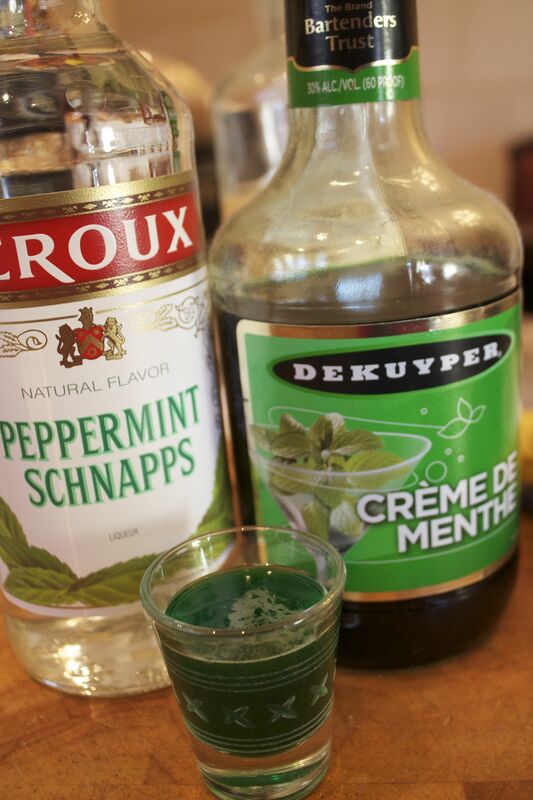 I once started a party with Mint Shooters (2 oz of Creme de Menthe and 1 oz of Peppermint Schnapps shaken over ice and served in a shot glass). Bracing! 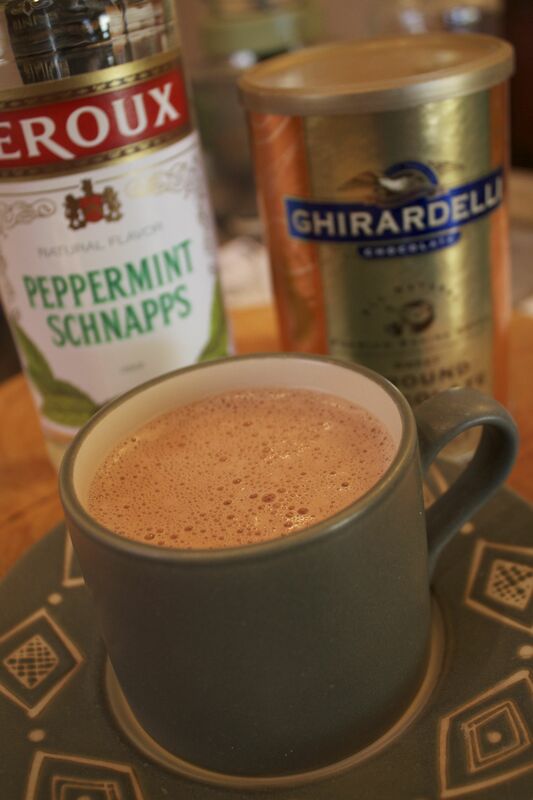 Two of my favorites things to make with Peppermint Schnapps are the Polar Bear Shake and Hot Schnocolate. Add milk and ground chocolate to a saucepan. Heat while stirring until steaming. Add in Peppermint Schnapps. Serve in mugs topped with either whipped cream or marshmallows. Here is another of those recipes that uses a box of cake mix in a different way. 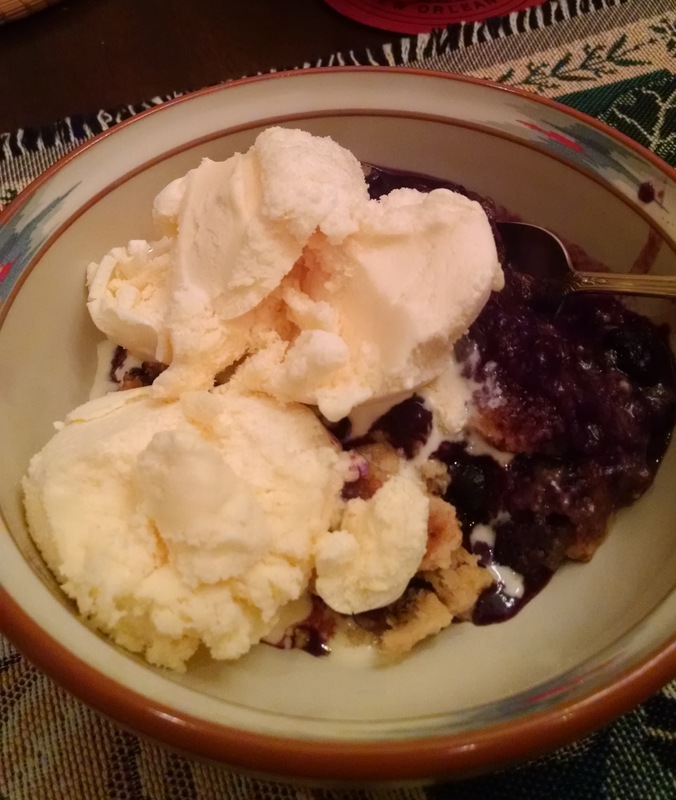 It comes from my Aunt Katherine and is one of those quick, easy and delicious things that taste like it took a lot more effort than you did. Mix pineapple, blueberries and sugar today and pour into a 9 X 13 baking dish. Sprinkle the cake mix over the top. Dot the top with the butter. Bake for 40 to 45 minutes. 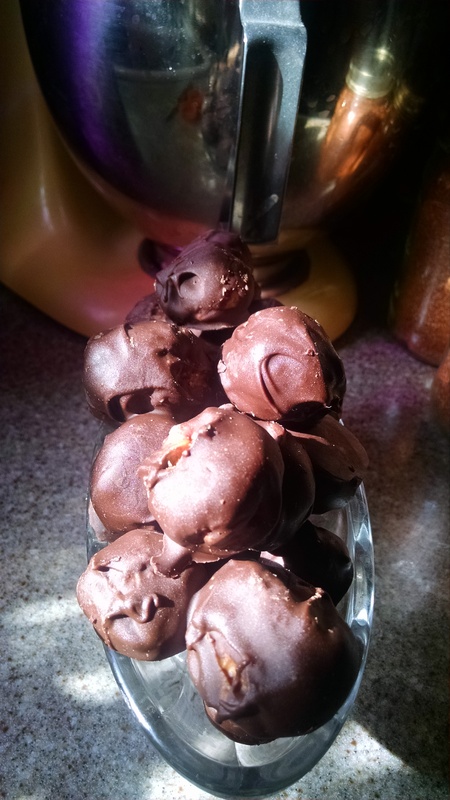 My go-to holiday snack is Chocolate Peanut Butter Balls. I tore the recipe out of a Southern Living magazine eons ago and, after a few tweaks (like adding coconut and vanilla), have made double batches nearly every year since. These are also known as ‘buckeyes’ for the lighter brown spot you get from where it was touching the wax paper. Combine first 7 ingredients, stirring well. Hands work best for this part. Shape mixture into 1-inch balls. Chill for about 30 minutes. Combine chocolate morsels and shortening in the top of a double boiler and cook on medium heat until chocolate is softened; stirring well. Turn off heat and dip each peanut butter ball into chocolate mixture. Place on wax paper to cool. If you live in the South, store in the refrigerator. For every 8 oz of morsels use a tablespoon of shortening. I tell you this because you will probable need to melt some additional chocolate, unless you’ve got a stingy dipping method or you’ve been eating the balls before dipping.